In 1900, before Walt Disney was born, architecture student Fred Thompson awoke from a vivid dream. Hunger kept him awake as he drew everything he had foreseen. 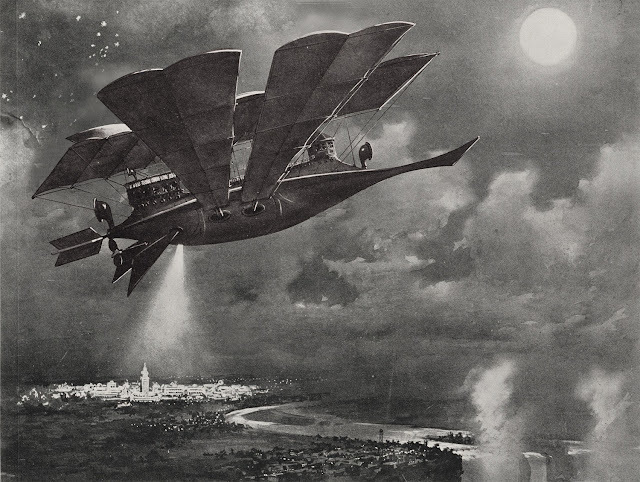 Thompson imagined a passenger ship that would seem to fly, giving the effect of soaring higher and higher until the airship reached the Moon. 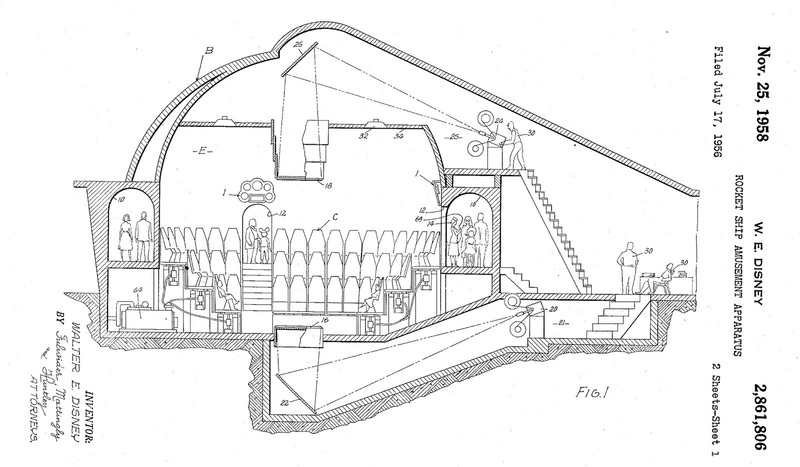 He sketched an attraction that would present a realistic simulation of flight, with a room next door decorated as a Moon cavern. 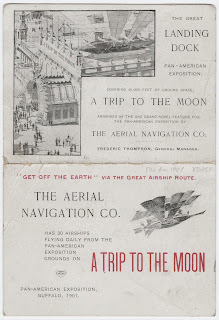 Thompson persuaded showman Skip Dundy to be his partner for an exhibit at the 1901 Pan American Exposition in Buffalo to be called A Trip to the Moon. The second most expensive attraction at the expo cost a quarter; Moon was so popular, they were able to charge 50 cents, raking in $200,000 while the fair was open. Before heavier-than-air flight was known to be possible, Thompson loaded thirty passengers at a time into the airship-ornithopter Luna, which had portholes in the sides and floor. Projection effects and movement of the airship made it seem to pass over Niagara Falls and rise higher and higher into the sky. The darkness of space was easy to simulate, and the Earth appeared to recede, shrinking in size. The airship encountered an electrical storm in space and then "landed" on the Moon (at Queer City, by the way). Passengers were led into a Moon cavern where Moon maidens danced and giants and little people dressed as Selenites mingled. After an audience with the Man in the Moon in his palace, the visitors entered a green room where everyone was served a piece of green cheese. The exit back to the fair was over a swaying suspension bridge. Hard to believe, perhaps, but grown men swore they had flown, if not to the Moon, then to somewhere outside the fairgrounds. That year, 1901, H. G. Wells published The First Men in the Moon and a year later, Georges Méliès created the groundbreaking film Le Voyage dans la Lune, featured in Martin Scorsese's Hugo (2011). When Walt Disney was a child, the Wright brothers proved manned flight possible and as he produced Mickey Mouse, Robert Goddard and German scientists, including Werhner von Braun, improved modern rocketry. Walt Disney personally patented his concept for a simulated trip to the Moon—swearing that the ideas were his and no one else's. (Most Disney patents are "assigned" to Walt Disney Productions by their inventors.) 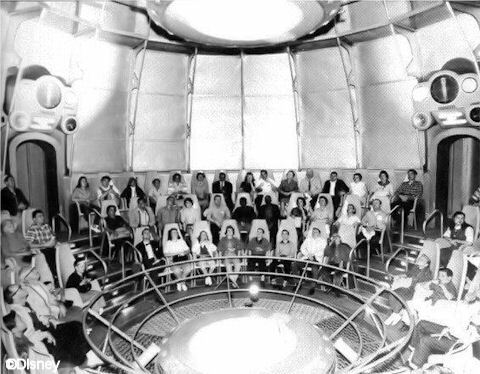 The audience would be shown a cylindrical rocket, then led into a cylindrical room that they would assume was in the rocket itself. View screens on the floor and ceiling would be the only "windows." “Welcome aboard, friends. This is Captain Collins speaking. Please observe the two television screens...The upper screen looks ahead, the lower scans the view below our ship. In order that you may see as much as possible during our flight through space, I’ll select pictures from television cameras mounted fore and aft on our ship...” The screens were actually rear-projection Bodde screens with mirrors used so that the projectors could be placed more conveniently. Mirrors made the rear-projection practical. The seats were designed to vibrate—early sub-woofers—and gauges and indicators around the room were also synchronized with the show. After blast-off, Captain Collins mentioned the space station Terra before making the 238,900-mile trip to the Moon. An emergency would make landing impossible and the spacecraft would be lucky to return to Earth—eerily similar to the Apollo 13 mission. To double capacity, two identical theaters were constructed. One group of 102 passengers would be halfway to the Moon as would-be astronauts were led into the second theater. The cabins were originally named the R. S. Luna and the R. S. Diana—R. S. for "Rocket Ship." In 1901, the Luna made Fred Thompson lots of money. He brought his show to Tilyou's Steeplechase Park in Coney Island and made even more money in the 1902 season. For the 1903 season, he built a dazzling new park and staged a publicity stunt in which an elephant apparently dragged his show from Steeplechase to the new Luna Park. Collins was a solid choice of a name—an improvement over Floyd Graham, the captain in Rocketship X-M or Joe Sweeney, the name of the captain in Destination Moon—but it spookily predicted the name of Apollo 11 command module pilot Michael Collins, whose rocket to the Moon was still fourteen years in the future. While Neil Armstrong and Buzz Aldrin walked on the Moon for the first time, Collins orbited the dark side and then brought the spacecraft and his crewmates back to Earth. The Moon shown on the viewscreens was a six-foot diameter model created by Roger Hayward, who had sculpted an even larger Moon for the Griffith Park Observatory. Rumor has it that Hayward's fee was rejected as too high and a crew at the Disney studio failed in a half a dozen attempts before Hayward was paid what he asked. The model was also used in three television episodes: Man in Space, Man and the Moon, and Mars and Beyond. 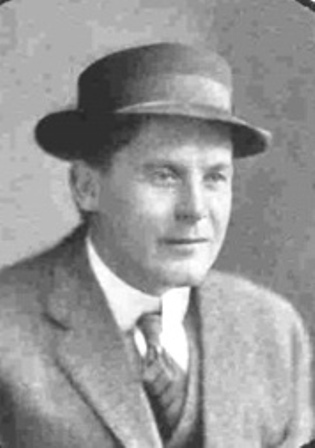 Hayward worked for a Pasadena architect and would later co-write a book with Linus Pauling. 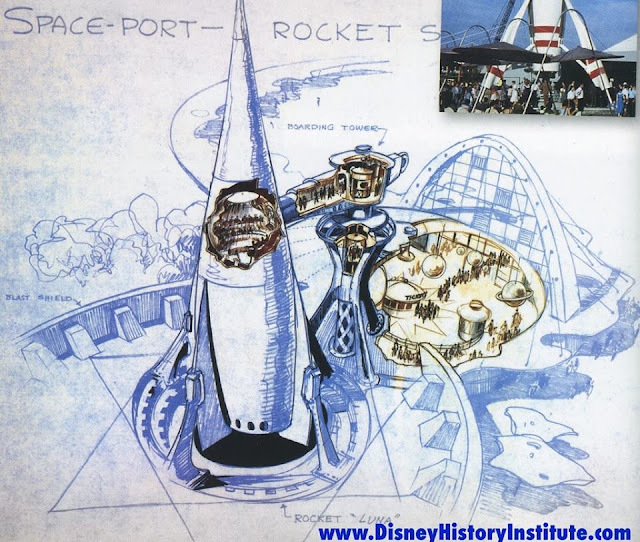 John Hench was the designer most associated with the Rocket to the Moon, which was sponsored by Trans-World Airlines, then controlled by Howard Hughes. Hench's early sketches struggled to put the simulator into a display rocket, but that idea was eventually abandoned. Hench's slim, cigar-shaped Moonliner was meant as a 1:3 scale model and the theaters hidden behind the "blast wall" of the spaceport's architecture were presumably inside other rockets. What kind of spaceport has only one rocket? As hundreds of workers raced to finish Disneyland before its pre-announced opening day, a "careless welder" started a fire in the wooden Rocket to the Moon building, one of the last to be completed. The fire was quickly extinguished, and there were some who thought it had more to do with labor unrest than carelessness. The show was not able to open on Black Sunday but, following the script, comedian Danny Thomas was interviewed outside speaking as if he had just experienced the attraction. The show opened that Friday—five days late—due to a disgruntled electrician fouling things up, it was said. The novelty of the show is hard to overstate. Nothing had ever escaped the Earth's gravity, and no human had ever experienced the vacuum of space. In 1957, the Russians launched Sputnik. In 1961, cosmonaut Yuri Gagarin became the first man in space, beating American Alan Shepard by three weeks. While NASA focused on getting to the Moon, anyone could take a Rocket to the Moon at Disneyland. Douglas Aircraft took over sponsorship in 1962 and the show was completely rebuilt for Tomorrowland '67, reopening as Flight to the Moon on August 12, 1967. Mankind first stepped on the lunar surface July 20, 1969, and the simulator became Mission to Mars in 1975. The attraction closed permanently in November 1992. The Luna soars above the Pan American Exposition in Buffalo, NY in 1901.